This project has me really excited. It's all about having the clothes that I'd love to wear, but could never afford. It's also a new challenge because it involves knits, something I've never tried. 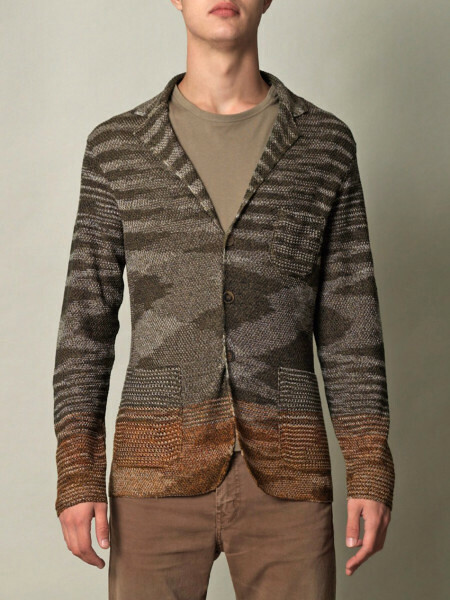 The Missoni sweater / blazer. I LOVE this look. There's something about Missoni that I find very approachable. It always looks so put together, but in a very relaxed way. I guess I'd call it "friendly fashion". It's soft, relatively unstructured, and most importantly....colorful! Unfortunately, I don't have a spare $1800 hanging around right now! Plus it would be so much more fun to try to make something like this. The artistry here just blows me away! 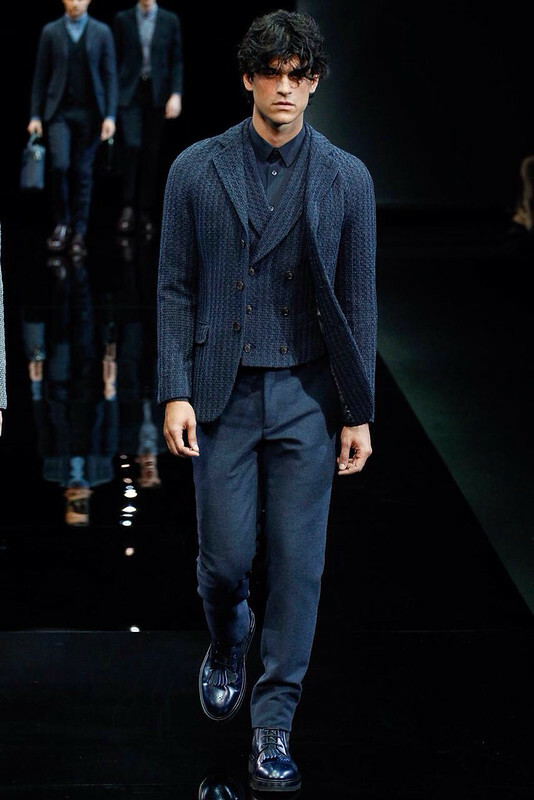 Armani does this sweater / jacket look too, but somehow it just seems a little severe and off putting. (Inspite of the raglan sleeves). Could you be friends with this guy? Or you have to be Adonis with it stretched across your gym toned pecs! With a vision in my head I went on the search for colorful sweater knits via Google and ended up at Vogue Fabrics. 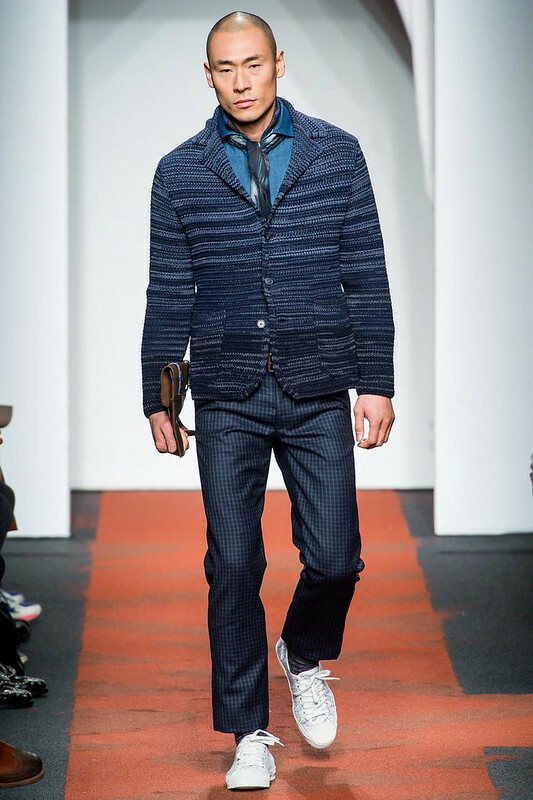 They had several "Missoni-esque" knits which really got my wheels spinning. I'm glad to report that I'm getting smarter about buying fabric online. No more fabric disappointments for this guy. I still haven't quite recovered from the "cheap stretch velvet" incident! Vogue Fabrics offers a swatch service for $1/ swatch. I ordered 4 and had them within a week. Best $4 I've spent in awhile. Not huge swatches ( about 2" square), but enough to get the general idea. All four were really winners, but I limited myself to ordering just three. 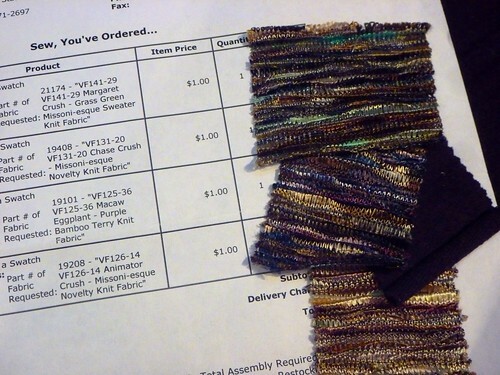 Again, I had my fabric within a week for a mere $6 shipping charge. Score! Next I turned to Etsy in search of a pattern, and came up with two choices. From 1979, this Simplicity unlined blazer specifically for stretch knits. Check out the shoulders on the green version! 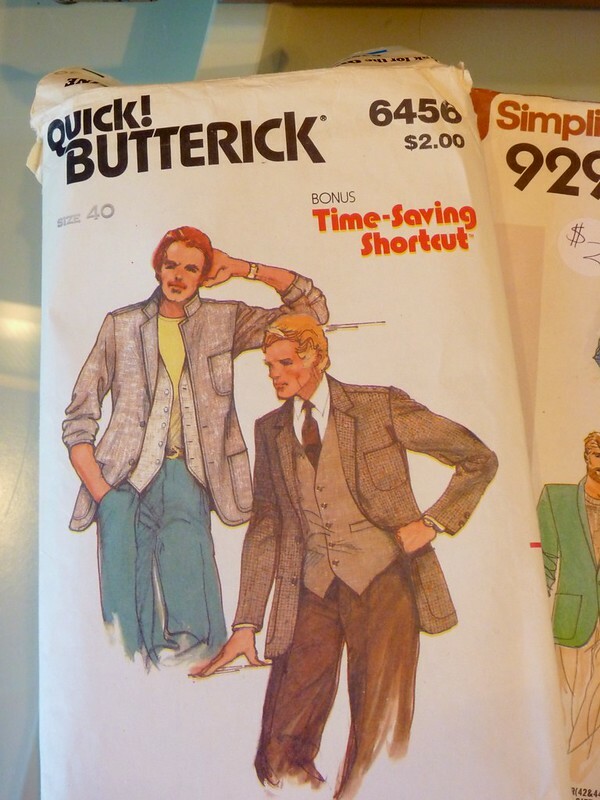 Also this Butterick, which promises a time saving shortcut! 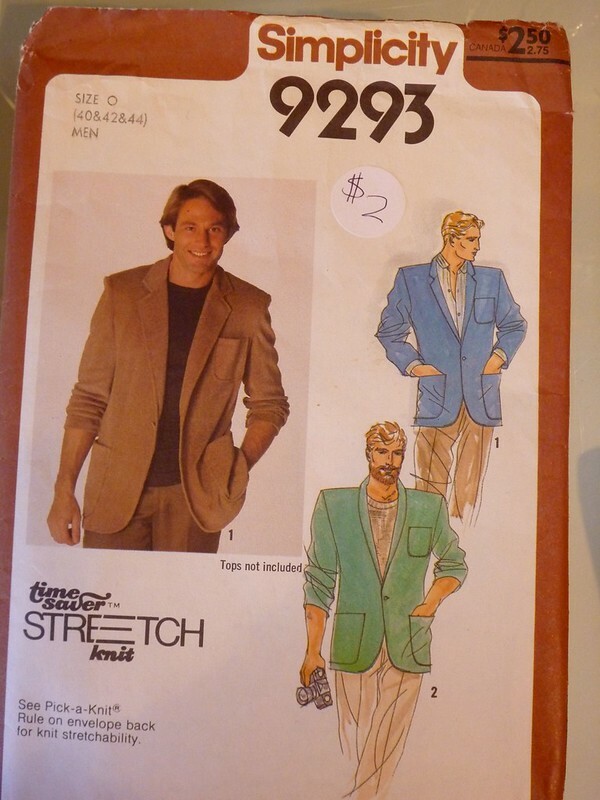 The Butterick is different for a man's blazer, in that it has a back yoke and one piece sleeves. It's very straight "boxy" through the torso. Appealing, but just not right for this project. I think this would make a great linen Spring jacket, so I've filed it away for the future. The Simplicity has a two piece sleeve and is more fitted. It also has the requisite patch pockets. 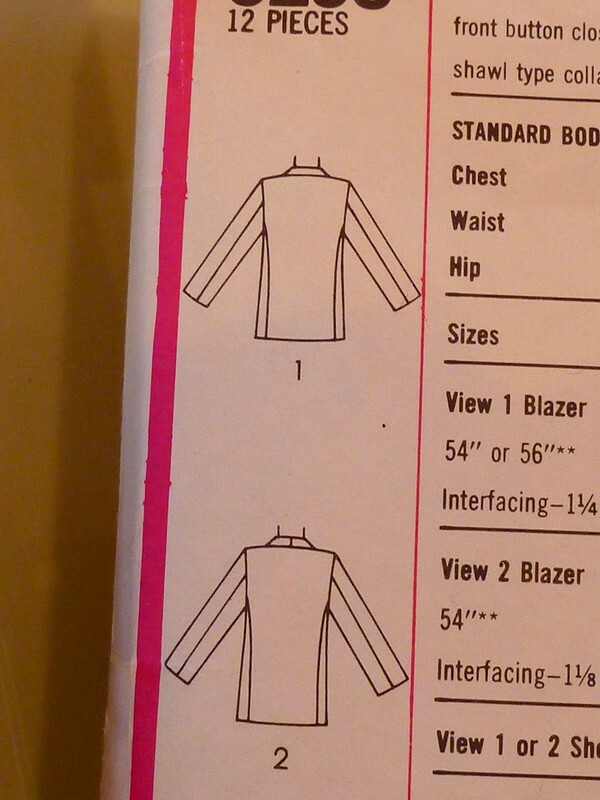 There are only 2 vertical seams opposed to the 3 seams of the Butterick. Simpler is better in this case. Especially since I've never sewn a knit before. So the Simplicity wins! I'm off to buy ball point needles (the only thing I really know about sewing knits), and then I'll get started on a muslin. Looking forward to this creation. This will be so comfortable being a knit. Casual and Classic and Classy once you get your hands on that fabric and pattern to make your magic. Those outfits are yummy as well as the models! Wow. Looking forward to the progression on this one. Your always very inspiring. De-lurking to say that I love your inspiration photos and can't wait to see how you translate them into your own wardrobe. 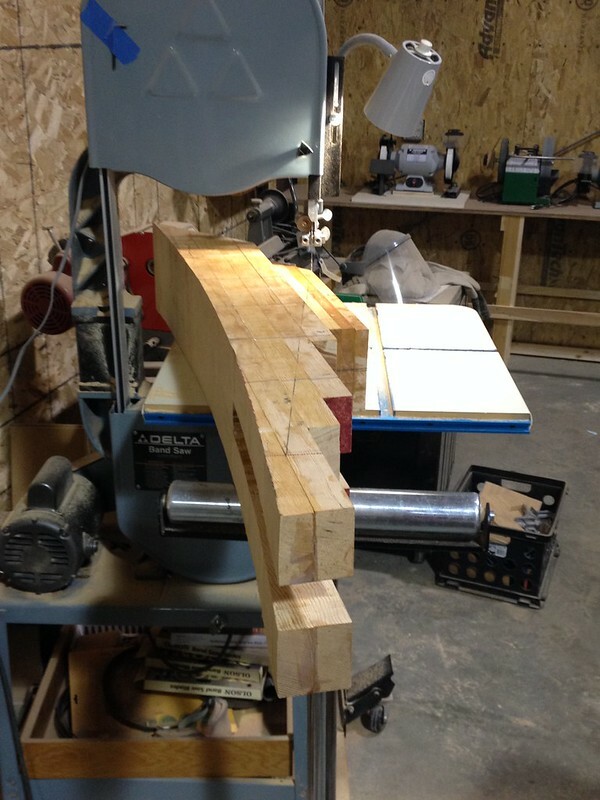 Your work is wonderful and I'm sure this next project will be no exception! 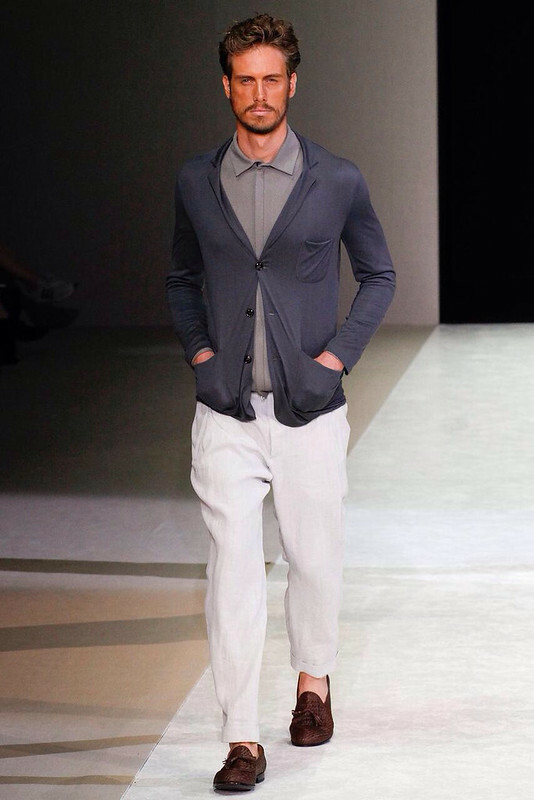 This is the first time for me to see this style of sweater. It will look great on you. Hi, found your blog after looking at some of Ryuichiro's patterns. Very inspiring mate! Like you I am looking to make my own clothes and have some fun. I have one question: did you find you had to adjust the sizings in the patterns? I am 6' with a 40-41 chest. The patterns I have seen are a bit small, although they are for jackets, the military style, so I am assuming the cut will be full. Any advice? Again, great inspiring stuff. Hi Chris, Yes, the patterns are very small. The X-large is probably equal to a 38 chest. You will want to make a muslin prototype for sure. Just keep track of the adjustments you make because you can apply those same changes to the other patterns. Feel free to contact me with any questions. 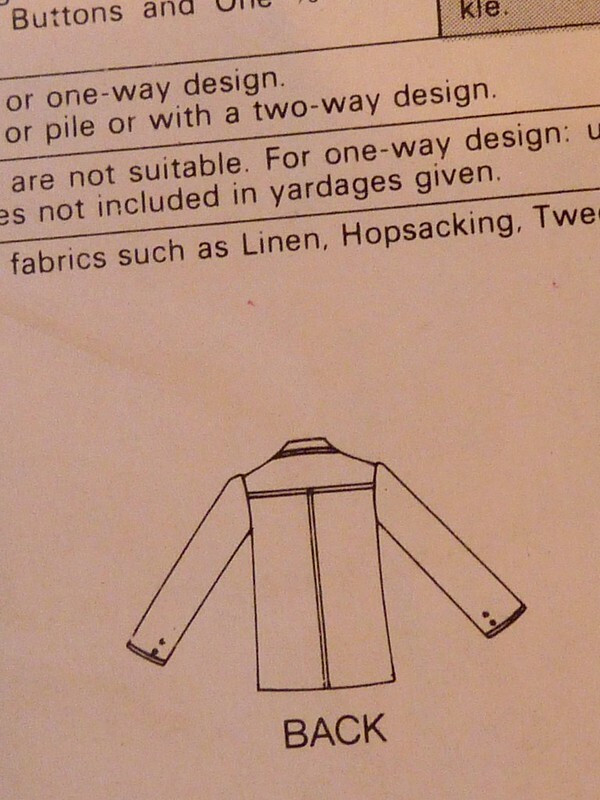 The purpose of this whole crazy blog is to help other sewists make the coats of their dreams. Sew on! Wonderful fabric, I was almost ready to send my Chicago based friend to get some for me! I'm sure you'll make a great job of the jacket. Your advantage seems to me that you know your own style and you have the patience to get things right. I think you're gonna look fabulous! One thing with knits - make lots of samples. Use all kinds of scraps and bits or even order extra fabric so you get really comfy working with your fabric. Working with knits is NOT hard - just different than wovens. I'm not terribly patient and I kinda hate making samples, but I've never regretted making the samples afterwards, and have certainly regretted the times I didn't 'cos I was too impatient.